Advanced nutritional support specifically tailored for the over 50's. With glucosamine, chondroitin, and collagen plus supporting vitamin & mineral joint complex. To help keep you moving and active. Free from preservatives and artificial colours. Gluten free. 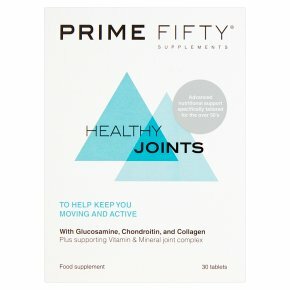 Not tested on animals.Food Supplement Prime Fifty Advanced Daily Joint Formula has been specifically developed for the needs of the over fifties as part of a nutritional range designed to help you stay active, continue doing what you've always enjoyed doing, and to really make the most of a long and healthy life. Supporting your joints and connective tissues is vital for movement and agility, and this unique formula includes the following key nutritional ingredients: Glucosamine - Found naturally in high concentrations in joints, as a basic building block of joint cartilage. Chondroitin & Hyaluronic acid - Also found naturally in joint cartilage and connective tissues. Hydrolysed Collagen - Collagen is a very strong and fibrous protein which plays a major role in connective tissues such as tendons and ligaments and also cartilage. Manganese and Copper - Contributing to the maintenance and formation of connective tissues, such as tendons and ligaments. Vitamin D - Helps to reduce the risk of falling associated with muscle weakness. Falling is a risk factor for bone fractures in the over 60's Vitamin C for normal collagen formation, needed in cartilage and connective tissues. Selenium, Vitamin C and Zinc - Contributing to the protection of cells from oxidative stress. Oxidative stress is the damage caused by free radicals to our cells, which is believed to increase as we age. BioPerine® - A patented and relevant ingredient, added to our tailored blend, to help increase bioavailability ie support micronutrient absorption, which tends to decrease with age. Prime Fifty products are formulated specifically for the needs of the over 50's. This formulation is manufactured under GMP (Good Manufacturing Practice) in the UK. All ingredients have been audited against the highest quality standards. Directions: One tablet to be taken twice per day, with a cold drink at meal times. Do not exceed the recommended intake. Food supplements are not a substitute to a varied and healthy diet. Keep out of reach of children.<br><br>As with any supplement, check with your physician before taking if you are under medical supervision.<br><br>Those using blood thinning medication (eg Warfarin) should consult their doctor before using. Do not take if you are allergic to shellfish.